Despite the prevalence of formal and informal standards for employee attire, research on its role is limited. Social psychological theories suggest that work attire can be a meaningful, expressive symbol associated with one's occupational identity. Organizational theories suggest that work attire can affect both individual and organizational outcomes. Bridging these perspectives, this study considers work attire's potential to influence micro and macro organizational dynamics. A framework of the dimensions influencing factors and outcomes of work dress is used to assess the results of a poll of members of the Canadian Forces, an organization whose work attire is highly conspicuous and rigidly homogeneous. Though a slight majority of participants responded that their uniform did not impact their operational focus, comments indicate both organizational influences and individual concerns with specific attributes of attire. Attitudes toward work attire may be indicative of broader issues of organizational identity. 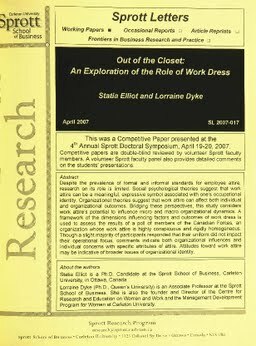 Elliot, Statia, & Dyke, L. (2007). Out of the Closet: An Exploration of the Role of Work Dress. Sprott Letters, April(2007).